ePub Version Help patients live a more flexible lifestyle with step-by-step advice on insulin pump therapy. Offers practical guidance on how to help patients successfully manage their diabetes using an insulin pump. Help your patients live a more flexible lifestyle with step-by-step advise on insulin pump therapy. Putting Your Patients on the Pump offers physicians, nurse practitioners, physician assistants, clinicians, and educators practical guidance on how to help patients successfully manage their diabetes using an insulin pump. 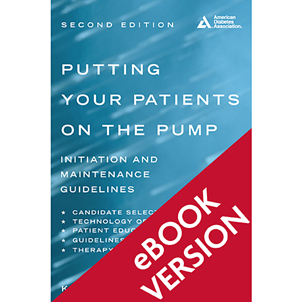 This revised and expanded edition provides an in-depth description of insulin pump therapy advantages and disadvantages, pump and infusion set options and selection, pump candidate basics, preparing the patient, pump start-up, pump therapy management, resources, tips from pump experts, and insulin pumps of the future. Filled with checklists and step-by-step instructions, this book is the idea resource for healthcare professionals with expertise in diabetes care who wish to successfully start and maintain diabetes patients on insulin pump therapy.